I was trying to imitate that flat Japanese style that has so many crazy patterns in one picture it makes you kind of dizzy. Anyway, this was inspired by the way white and especially black people are often portrayed in Japanese cartoons. Black people are either extremely stereotypical and/or ugly, while white people can be either very beautiful or ugly depending on how we are supposed to feel about them. Rather sad when you think about it. 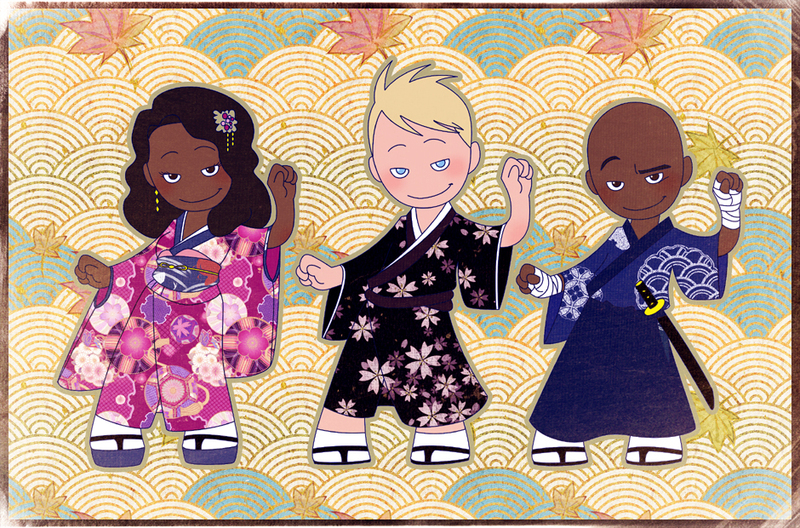 While drawing this I started wondering how one white and two black people would have ended up in the old Japan, and what on earth were they doing there? Obviously they would still be “bad guys”, so their foe would be some young Japanese man/woman who had to get rid of these funny looking intruders. Lots of flashy and physically impossible battles follow.